The marine environment is an integral part of life on Long Island making this area attractive toresidents and visitors alike. This area has a long tradition of commercial fishing, trading and seagoing transportation that has helped to define our maritime heritage. Given the extent and quality of our coastal resources, our waters hold aesthetic, recreational and economic value that is unmatched in the region. Whether taking in a sunset on your favorite beach or dining on locally harvested seafood at your neighborhood restaurant, it is easy to forget about what’s happening under the water. It is in this hidden realm that important ecosystem functions take place that make everything else we see possible. 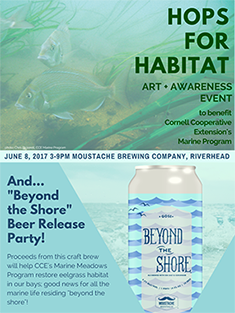 Eelgrass meadows are the driving force behind this ability of our waters to remain clean and to produce the bounty from which we harvest. Eelgrass meadows serve as an essential habitat for many species of fin and shellfish, provide protection against beach erosion by stabilizing the shoreline and help to keep our local waters clear of sediment. Species like fluke, flounder, striped bass, and bay scallops all use eelgrass meadows during some stage of their lifecycle. Given the significance of eelgrass, it has been described as an “ecosystem engineer” creating unique habitats wherever it grows. Despite the significance of eelgrass populations in local waters, populations have declined drastically over the past few decades due to numerous natural and human caused impacts. Cornell Cooperative Extension (CCE) Marine Program has been actively involved in the protection and restoration of local eelgrass meadows for the past two decades, in which time they have developed efficient methods for re-establishing meadows in many areas where it historically occurred. CCE’s “citizen scientist-based” effort involves the use of land-based volunteers to assist in eelgrass restoration activities through participation in the “Marine Meadows Program”. 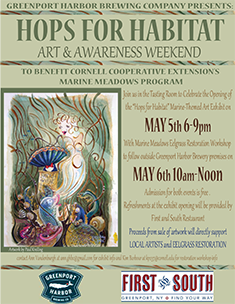 To raise awareness and support for the Marine MeadowsProgram and the importance of marine habitat, CCE Marine Program began hosting art and awareness events known as “Hops for Habitat”. 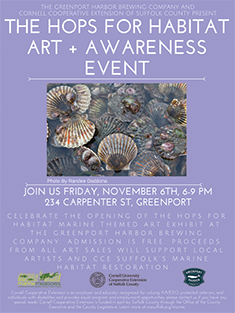 These events are simply art shows hosted at a local breweries, featuring the work of local artists inspired by the beauty and importance of our marine environment, and often include a specially created craft beer made by the hosting brewery. 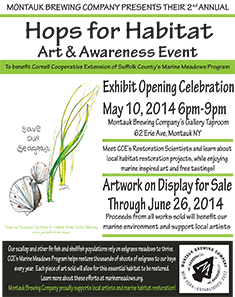 Proceeds generated from art and beer sales benefit marine habitat restoration, all while supporting local artists and brewers. 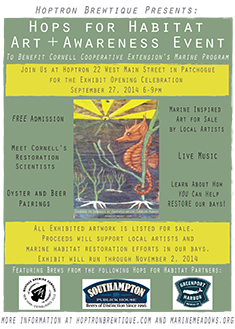 In addition to the tasty craft beer and wonderful artwork on display, the art exhibition opening celebration often features live music, raw bars with locally grown shellfish and opportunities to hear about marine habitat restoration efforts from CCE's restoration scientists. 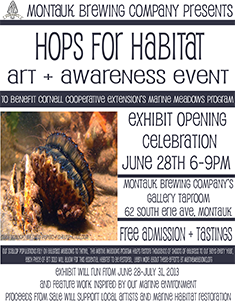 If you are interested in hosting a "Hops for Habitat" event at your Long Island brewery, please contact Kim Barbour at 631-461-5294 or kp237@cornell.edu.